Every super hero needs a Super-Pet! 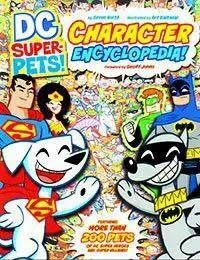 This illustrated encyclopedia features in-depth profiles, stats, and history about the DC Super-Pets and their owners. From Supermans loyal dog, Krypto, to Batmans heroic hound, Ace, this guide to the Worlds Greatest Pets has more than 200 DC characters, including many never-before-seen pets, all illustrated in Art Baltazars Eisner Award-winning style! With an introduction by legendary creator Geoff Johns, the DC Super-Pets Character Encyclopedia is sure to please comic book lovers young and old.